This feature enables you to review the add/delete history for service contacts for all service contacts in a case. Ensure that you are on the Workspace tab (A) located on the top navigation menu. The Cases page will display by default, but if not, click the Cases tab (B). 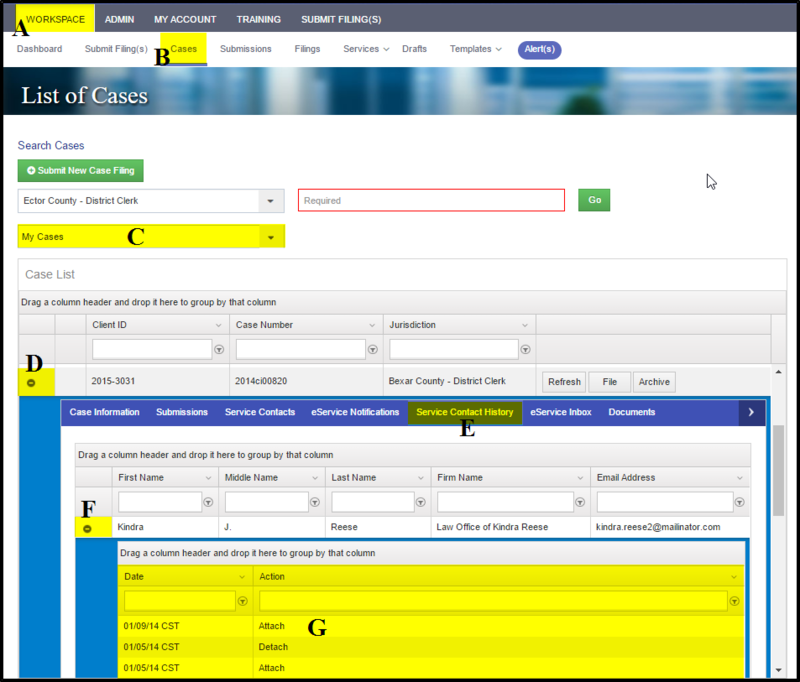 Under Search Cases, click on the drop down menu (C) to view the options. My Cases, Firm Cases, or Archived Cases will display. Select either My Cases or Firm Cases on the dropdown menu. After locating the filing, click on the + sign in the far left column. (D), this will open the sub-tabs for this case. Select the Service Contact History tab (E). All the case Service Contacts will be displayed. Click on the + sign in the far left column of the service contact’s name (F). The add/delete history for that service contact will be displayed (G).